Manufacturer of a wide range of products which include upvc drop pipes for agriculture, agriculture pipes, submersible pump pipes, upvc submersible column pipes, riser pipes and upvc submersible column pipes for boring. We are leading manufacturer of UPVC Drop Pipes for Agriculture. Smooth internal surface allows a friction loss (free) flow of water with energy saving and tensile strength in considerable amount. Packaging Details: packed in plastic bags as specified depending on the size and duty of the pipes. We are offering for Pipes For Agriculture in our clients. 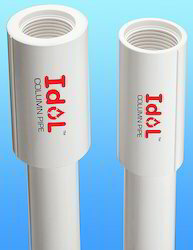 We are leading manufacturer of uPVC Column Pipes ranging from 1" inch OD to 4" inch OD. The available duty of pipes is eco, medium, standard, heavy and super heavy. CNC machines are provided for quality and consistent threading. The modernized laboratory is available for all kinds of testing for quality assurance. Area of 130000 sq. feet. Packaging Details: Packaging Of Pipes Is Dependent On The Pipe Size And Duty. We are one of the prominent manufacturers and suppliers of an array of Submersible Pump Pipes, that is specially fabricated for submersible pumps. Our products are manufactured in conformance with the highest quality standards utilizing advanced technology for the process of production. Knowing for their long shelf life, these products are widely appreciated by the clients all over the country. The entire range of products are available as per the need and desired wants of the clients. 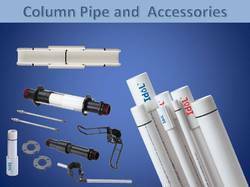 We are a reputed organization engaged in offering an extensive range of UPVC Submersible Column Pipes. These products are manufactured using premium quality material and other necessary components. We also offer these products in customized form as per the specification detailed by the clients. The offered range is appreciated for their high tensile strength, durability and high performance by the clients. Clients can avail these products at the most nominal rates. We are offering for Riser Pipes in our clients. We are leading manufacturer of uPVC Column Pipes for Submersible Pumps. We are a reputed organization engaged in offering an extensive range of UPVC Submersible Column Pipes For Boring.These products are manufactured using premium quality material and other necessary components. We also offer these products in customized form as per the specification detailed by the clients. The offered range is appreciated for their high tensile strength, durability and high performance by the clients. Clients can avail these products at the most nominal rates. We are one of the prominent manufacturers and suppliers of an array of Starter Pipes, that is specially fabricated for submersible pumps. Our products are manufactured in conformance with the highest quality standards utilizing advanced technology for the process of production. Knowing for their long shelf life, these products are widely appreciated by the clients all over the country. The entire range of products are available as per the need and desired wants of the clients. We are offering for Borewell Pipe in our clients. With a plant capacity of 8000 MT per Year. We are offering for UPVC Column Pipe For Submersible Pump in our clients. These pipes are threaded available in size from 33 mm (1") to 113 mm (4") in standard length of 3 meter. Properties don't change up to maximum ambient temperature 70 deg C.
Available in different pressure medium, standard & heavy pipes and maximum installation depth 1400 Feet. 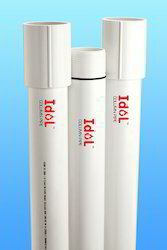 A sure replacement for MS, GI, HDPE & Steel pipes. Depth in Meter Pressure In Kg/cm2 Pulling Load in Kg, Depth in Meter Pressure in Kg/cm2 Pulling Load in Kg. Depth in Meter Pressure in Kg/cm2 Pulling Load in Kg. Depth in Meter Pressure in Kg/cm2 Pulling Load in Kg.